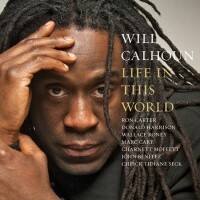 Living Colour’s Will Calhoun was not weaned on rock ‘n’ roll. The talented drummer grew up listening to his father’s bebop records and later attended the Berklee School of Music to study jazz. Shortly thereafter he meant Vernon Reid, and the rest as they say is history. After musical explorations that have taken him from the hard rock landscape of Living Colour to the heavy grooves of Jungle Funk to the underground hip hop of Mos Def, interspersed with extensive studies in Africa, Calhoun has returned to the post-bop jazz of his previous solo efforts. According to the liner notes by Columbia University Professor C. Daniel Dawson, all of the tracks on the album were first takes and, as producer, Calhoun made sure the drums and bass (performed variously by Carter, Moffett, Doug Wimbish, Alioune Wade, and John Benitez) are center stage, not “locked in a closet.” Make no mistake, this is a drummers album, set to showcase “how magical a beautifully tuned set of drums can sound when impeccably recorded.” And magical it is! Kudos to Will Calhoun along with Ron Saint Germain (who mixed the album) and the rest of the band (Marc Cary and Cheick Tidiane Seck on keyboards, Donald Harrison on sax, and Wallace Roney on trumpet).